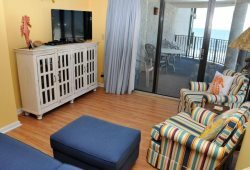 Sea Castle 3F is a classic North Myrtle Beach three-bedroom condo, perfect for family vacations on the oceanfront. Step into this comfortable third-floor property, and youll instantly be greeted by incredible ocean views from the floor-to-ceiling windows in the living room. The large balcony has plenty of room for your whole family to enjoy the view and fresh ocean breezes. This condo has been renovated in 2014 with new furniture and paint! The fully equipped kitchen will make it easy to prepare meals for your group, and the dining area will seat eight with its dining room table and breakfast bar. With three bedrooms and two bathrooms, this unit will accommodate up to ten people comfortably. The master bedroom has a king bed and upgraded private bath. A hallway bedroom features a queen bed and cable TV, and the third bedroom is a pirate-themed kids' room with fun decor. Enjoy the on-site pool and hot tub, or layout in the spacious deck area. The beach access to Sea Castle makes it easy to walk out to the beach, complete with two showers to ensure none of the beach will come inside with you at the end of the day. Sea Castle is conveniently located just minutes away from the famous restaurant row on Highway 17, and close to Myrtle Beach attractions. Call us to make Sea Castle 3F the home base for your next vacation!